Imagine Communications has stated an OB truck built for Swiss production company tpc is now up and running. To deliver high performance and multiformat capabilities across a broad range of productions, the truck, named UHD1 HDR, uses standards-based IP connectivity. Providing extensive functionality in a compact form, the truck is the first step in tpc’s aggressive programme to move to an all-SMPTE ST 2110 production and delivery infrastructure. From its base in Switzerland, tpc, the technical service provider for national broadcaster SRF/SRG, manages coverage of a broad range of events, from football to Alpine and Nordic skiing, as well as theatre, concerts and opera. When designing a new large scale truck, flexibility was critical, allowing it to switch from sports to arts, day to day. The truck build also came at a time when tpc’s broadcaster clients were expressing growing interest in acquiring in the highest quality, including 4K resolution and extended dynamic range and colour gamut, to futureproof content and maintain its value for audiences. Imagine Communications provided the IP-connected infrastructure using commercial off-the-shelf (COTS) switches and hardware, which allowed uncompressed Ultra HD production when required. Central to this was the Selenio Network Processor (SNP), which is now widely regarded as the most powerful and flexible gateway and video processor in high performance IP implementations worldwide. The compact SNP provides high density signal processing with complete freedom to select formats by signal or by production. It also delivers gateway conversion to external SDI signals. The new UHD1 HDR truck also relies on Imagine’s Magellan SDN Orchestrator to provide system-level control of the complete network, as well as the company’s EPIC MV multiviewer for fully flexible monitoring. This winter UHD1 HDR is fully booked on World Cup winter sports and Euro League and Champions League football, among other events. 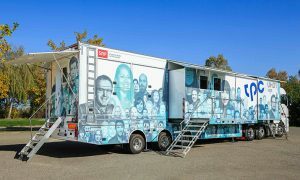 tpc and Imagine Communications are to stage a one-day event to showcase this new truck to end users, systems integrators, partners and the press on Tuesday 19 February 2019, at the Technology and Production Center in Zürich. UHD1 HDR broadcast its first match in the Swiss National Hockey League in Zürich on 19 October, and is now in regular use.